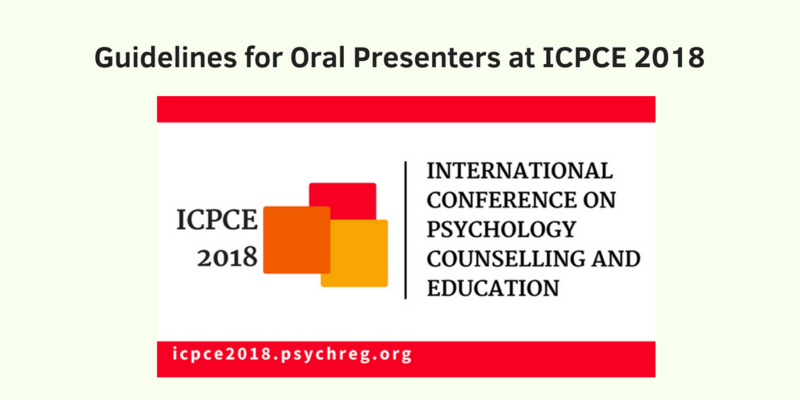 Congratulations on having your paper accepted for oral presentation at the 1st International Conference on Psychology, Counselling and Education (ICPCE 2018). As you prepare to condense your research paper into a digestible presentation, we ask that you take time to read these guidelines. You will only have 15 minutes to deliver your paper’s most important information. Therefore, it is important that you efficiently manage your presentation within the allotted time. Do not ramble, do not make unnecessary comments, do not share the story of your life. There will be moderators for each session. After your presentation is introduced, have at least a minute to have the audience ready to listen to your presentation. This can be done by showing your title slide and saying what your research is all about. The moderator will give you a cue if your time is nearly up. We advise you to use no more than one slide per minute of your allotted time. It is better to decrease the amount of information presented on one slide rather than to confuse the audience with slides that contain too much information and cannot be read quickly. Send us a copy of your PowerPoint, so in the event that your copy does not work we still have a back-up. Stick with the general outline of a written research paper for that of your oral presentation (research problem, related studies, method, results, conclusion, and implications). Listeners expect, and are familiar with this universal and logical format. Choose a font that is easy to read from the back of a room. Popular fonts include Arial, Times New Roman, or Century Gothic – but any professional-looking font is fine, as long as you use it consistently. Keep your PowerPoint simple and professional. We know it’s tempting to impress us with your amazing animations skills – but we’re not after that. We just want to know what your research is all about. Limit your bullets (preferably five lines), not including the slide’s title and subtitle. Each slide should have no more than 1–3 points to make, and the entire presentation should have no more than a total of three major points, all of which should be repeated in your Conclusions slide. Pictures, diagrams, and videos are very helpful and important in presentations. Tables usually contain too much information and may confuse the audience unless a key row or column can be highlighted, or significant results can be seen easily. Bulleted items on slides should contain keywords to remind you of what to say at that point in your presentation, or to emphasise an idea that you are presenting. Using complete sentences after bullets will slow down your presentation and distract from key points. Pictures, diagrams, and videos can demonstrate a complex idea quickly or show evidence to bolster or support a claim. To use them efficiently, you must make them immediately understandable to your audience. Orient the audience to your picture, diagram or video – pointing out exactly what they are seeing. This may include using an overall descriptive title for the image, and pointing out exactly where you want your audience to focus. This will allow you to educate everyone at the same time and orient any student or an early-career researcher to a previously unfamiliar image. References, if important, should be used within the presentation and not on a separate slide at the end of the presentation. It’s pointless to put your references at the end of your presentation. There are people who will ask questions not because they want to learn – but because they want to show off that they can criticise your research. It’s sad, but that’s the real world for your darling! Address the question as best as you can. If you don’t know the answer, just be honest – we have not heard of anyone who has been assassinated for not knowing the answer in their paper presentation. Take it easy. Think of paper presentation as your chance to share to people about your research. Although your research might have lapses, it’s still a product of your hard work – be proud of it. Anyone can be an audience, but it takes courage to present your research. Don’t try to wow us with highfalutin words. Intelligent people know how to get their message across in a simple and easy way. If you are confident with your research, you don’t have to sugarcoat it. Paper presentation is all about sharing your research; you are not in a competition with anyone to make your research sound so esoteric and philosophical – so just be natural and have fun. A Common Student Question: Which Is Easier, Quantitative or Qualitative Research?